Adenoid surgery is a procedure that removes the adenoid glands. These are small lumps of tissue that sit behind the nose above the roof of your mouth and are usually removed when your tonsils are removed. They are a part of your immune system and are designed to help you fight against infections and protect your body from bacteria and viruses. Only children have adenoids. At the age of 3, the adenoids are usually at their largest. Once a child grows to age 7, they usually shrink in size to around half. During the early teenage years, the adenoids will have shrunk so much that they are barely visible. Once a child reaches their late teenage years, they will eventually disappear. When Do Adenoids Need To Be Removed? Adenoids only need to be removed when they are swollen or enlarged. This often happens as a result of an infection, or via a substance that causes an allergic reaction in your child. Swollen adenoids usually cause discomfort in your child and it’s not enough to warrant surgery. However, some children may find that it causes a lot of annoyance and can even interfere with their daily activities. Sleeping difficulties – If your child has trouble sleeping at night, then it could be an issue with their adenoid glands. This can start with just snoring but can develop into sleep apnea, which is irregular breathing during sleep and tiredness throughout the day. It would be best to contact a certified otolarygonologist, or ear nost and throat doctor, if this is the case to diagnose the issue. Ear infections – If ear infections and glue ear (sticky fluid filling the ear) are common for your child, then you’ll want to notify your doctor to see if it’s a problem with their adenoid glands. Breathing issues – Your child will find it difficult to breathe and may experience a dry mouth if their adenoid glands are causing issues with their daily life. What Does Adenoid Surgery Involve? As mentioned before, adenoid surgery typically occurs at the same time as tonsil surgery. An ENT surgeon will carry out the procedure and it usually takes around half an hour. Your child will need to wait until the anesthesia wears off before being able to return home (usually an hour or two). Your child will be put under general anesthesia so they won’t feel any pain. Their mouth will be propped open to locate the adenoids. Once found, the surgeon will remove them by scraping away with a curette. Alternatively, the ENT surgeon might also use a diathermy instrument to apply heat to burn the adenoids. Once removed, cauterization might be used to stop the bleeding, or a pack made out of gauze will be applied to the skin of the mouth. Once the bleeding has stopped, the procedure is finished and your child can start to recover. External otitis is caused by bacteria or, less commonly, fungi. Typical symptoms are pain and discharge. Debris removal, antibiotic ear drops, keeping water and cotton swabs out of the ear, and pain relievers are the most common forms of treatment. External otitis may involve the entire canal, as in generalized or acute external otitis, or just one small area, as when pus accumulates in a boil (furuncle) or pimple. Malignant external otitis is a rare, very severe external ear infection that has spread to the temporal bone of the skull, causing a bone infection (osteomyelitis). A variety of bacteria, such as Pseudomonas aeruginosa or Staphylococcus aureus, can cause external otitis. Fungal external otitis (otomycosis), typically caused by Aspergillus niger or Candida albicans, is less common. Boils are usually caused by Staphylococcus aureus. Certain people, including those who have allergies, psoriasis, eczema, or seborrheic dermatitis, are particularly prone to external otitis. Injuring the ear canal while cleaning it (using cotton swabs) or getting water or irritants, such as hair spray or hair dye, in the canal often leads to external otitis. External otitis is particularly common after swimming, which is why it is sometimes called swimmer’s ear. Earplugs and hearing aids make external otitis more likely, particularly if these devices are not properly cleaned. Use of cotton swabs is a very common risk factor for external otitis. Cotton swabs should not be placed in the ear canal. Symptoms of external otitis are pain, redness, and discharge. The discharge is unpleasant-smelling and white or yellow and drains from the ear. The ear canal may have no swelling or slight swelling, or in severe cases, it may be swollen completely closed. If the ear canal swells or fills with pus and debris, hearing is impaired. Usually, the canal is tender and hurts if the external ear (pinna or auricle) is pulled or tugged or if pressure is placed on the fold of skin and cartilage in front of the ear canal (tragus). Fungal external otitis causes more intense itching than pain, and people have a feeling of fullness in the ear. Fungal external otitis caused by Aspergillus niger usually causes grayish black or yellow dots (called fungal conidiophores) surrounded by a cottonlike material (called fungal spores) to form in the ear canal. Fungal external otitis caused by Candida albicans does not cause any visible fungi to form but usually causes a thick, creamy white discharge. Boils cause severe pain. When they rupture, a small amount of blood and pus may leak from the ear. The doctor bases the diagnosis on the symptoms and an examination of the ear canal. To a doctor looking into the ear canal through an otoscope (a device for viewing the canal and eardrum), the skin of the canal appears red and swollen and may be littered with pus and debris. An infection caused by a fungus is also diagnosed based on examination or culture (a sample of the pus and debris is grown in a laboratory to identify the microorganisms). Sometimes fungal spores can be seen in the ear canal. Swimmer’s ear may be prevented by putting drops of a solution containing half rubbing alcohol and half white vinegar (acetic acid) in the ear immediately after swimming (as long as there is no hole [perforation] in the eardrum). Attempting to clean the canal with cotton swabs or other objects is strongly discouraged because such action interrupts the ear’s normal, self-cleaning mechanism and can push debris and earwax further inward. Also, this action may cause minor damage to the delicate skin of the canal, providing a site for bacteria to infect. To treat external otitis due to any cause, a doctor first removes the infected debris from the canal with suction or dry cotton wipes. After the ear canal is cleared, hearing often returns to normal. Usually, a person with mild external otitis is given ear drops containing vinegar and drops containing a corticosteroid such as hydrocortisone or dexamethasone to use several times a day for up to a week. Vinegar is helpful because bacteria do not grow as well once the normal acidity of the ear canal is restored. With moderate or severe infection, antibiotic ear drops also are prescribed. If the ear canal is very swollen, a doctor inserts a small wick into the ear canal to allow the antibiotic/corticosteroid ear drops to penetrate. The wick is left in place for 24 to 72 hours, after which time the swelling may have gone down enough to allow the drops to go directly into the ear canal. People who have severe external otitis (extends beyond the ear canal) may need to take antibiotics by mouth, such as cephalexin or ciprofloxacin. Pain relievers such as acetaminophen or ibuprofen may help reduce pain for the first 24 to 48 hours, until the inflammation begins to subside. People should keep the ear dry by practicing dry ear precautions (such as wearing a shower cap and avoiding swimming) until the infection clears up. To treat fungal external otitis, doctors thoroughly clean the ear canal and insert antifungal ear drops. Repeated cleanings and treatments may be needed. Some doctors believe that a combination of rubbing alcohol and white vinegar is particularly effective in fungal external otitis. Rubbing alcohol dries the ear canal and white vinegar creates an acidic environment that does not allow fungus to grow as well. Treatment of boils depends on how advanced the infection is. In an early stage of infection, a heating pad can be applied for a short time and pain relievers, such as oxycodone with acetaminophen, can be given to help relieve pain. The heat may also help speed healing. An antibiotic is given by mouth. A boil that has come to a head is cut open (incised) to drain the pus. When labyrinthitis is chronic, or long-term, a person may benefit from a type of physical therapycalled vestibular rehabilitation. This therapy involves exercises that aim to improve balance and reduce dizziness. Sinus infections cause 73 million days of restricted activity in the United States each year, according to a report from the Centers for Disease Control and Prevention. However, this finding is questionable because people with colds often believe they have sinus infections. With similar symptoms, a cold and sinus infection can be hard to tell apart. Sinus infections can also follow common colds. While many symptoms overlap, there are ways you can tell the difference and receive appropriate treatment. Common colds are viral infections that usulally clear up within one week. They are usually most severe between days 3 and 5, after which symptoms typically subside. Nasal discharge starts off clear and watery, but becomes thicker with a white, yellow or greenish color. After a few days, nasal discharge becomes clear again and dries. Colds can cause the nasal lining to swell, preventing mucus from draining properly. This can in turn lead to sinusitis. If you are prone to sinus infections, take care to treat your cold as soon as possible. Despite what most people may think, antibiotics do not help against the common cold, which is caused by many different types of viruses. Over-the-counter medications, on the other hand, are designed to combat the annoying symptoms the cold virus, and may help you feel better faster. Sinusitis, also termed rhinosinusitis, is inflammation of the mucosal lining of the nose and sinuses. The infection can begin from a viral infection or “cold”, which leads to a narrowing of the nasal passageways. Symptoms include thick colored nasal discharge, headaches, and facial pressure lasting more than 10 days without improvement. The biggest giveaway to determining if a sinus infection is bacterial is duration. Bacterial sinus infections tend to linger much longer than the common cold, and can last over a week or more. Don’t fly if you can avoid it. A flight can raise your chances of ear pain and other complications. If not flying is not an option, yawn and swallow or “pop your ears” when the flight is taking off and landing. Drink plenty of fluids and keep your head upright. You may benefit from a decongestant like “Afrin” or pseudoephedrine. Avoid drinking alcohol, which can cause dehydration and make your sinuses and the lining of the nose swell further. Finally, avoid smoking, being around smokers, and air pollution in general. Sinus infections much of the time will resolve with rest, fluids and symptomatic treatment. Sometimes, sinusitis can last for a very long time or come back frequently. If you miss work or other activities due to sinus infections or if symptoms occur frequently, see your doctor for an evaluation. Be sure to see an ear, nose, and throat specialist if your sinus infection does not go away. Some people are prone to sinus infections regularly or may have a chronic sinus infection. For these people, sinus surgery may be the best option and can greatly improve their quality of life. Nasal Sprays: both steroid and antihistamine. Oxymetazoline is effective but may worsen congeston if used for more than 3 days. Oral antihistamines: you need to show the pharmacist an ID to get the larger doses behind the counter. Pseudoephedrine is effective. Tonsillitis most often occurs in children, but rarely in those younger than two years old. Tonsillitis caused by bacteria (streptococcus species) Streptococcus species typically occurs in children aged 5 to 15 years, while viral tonsillitis is more common in younger children. A peritonsillar abscess is usually found in young adults but can occur occasionally in children. The patient’s history often helps identify the type of tonsillitis present (i.e., acute, recurrent, chronic). Hearing is an important sensory organ because it helps us interact more easily with the environment. Loss of hearing can be challenging when it happens, and especially when you do not know the treatment alternatives that you are open to. Here is what you need to know about types of hearing loss and how modern treatments and technology can help in the rehabilitation process. The first affects the outer ear, the eardrum and the middle of the ear. This hearing loss type happens when sound dissipates as it travels through the outer year and to the middle of the ear and the eardrum. There are a number of issues that can lead to it. These include tumors in the ear, holes in the eardrum or trauma to the ear. The second type of hearing loss is caused by damages to the nerve pathways which facilitate hearing. Most of the times, this is the kind of loss of hearing which happens as you grow older. When you have a sensorineural hearing loss, the hearing signal that will be getting to the inner ear will be strong but becomes weak when being converted into a signal by the brain. In most cases, people with sensorineural hearing loss will hear something, but it will be muffled or incoherent. The modern treatments and rehabilitation offered for loss of hearing are dependent on the type of hearing loss that you are suffering from. If you have a conductive hearing loss, surgery is one of the treatment alternatives that can help you make a full recovery. One of the main reasons why sound distortion occurs in the outer to the middle of the ear is when the bones that transmit sound between your ear canal and the inner ear no longer line up. In this case, a simple surgery to correct the bones will help restore hearing ability. On the other hand, when you have sensorineural loss of hearing, you will need a hearing aid to help amplify the sound that gets muffled as it is getting converted into signals. When the hearing aids technology started, it was simple and the devices used to hang outside the earlobe. However, the gadgets have now been refined and are smaller and very effective. 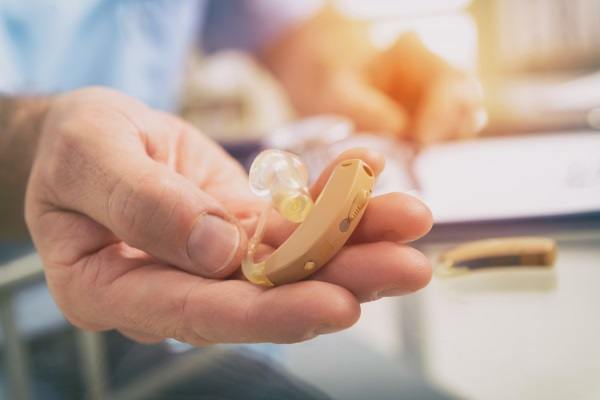 There is also the cochlear implants technology where the implants which are currently the most effective way for people with hearing loss to effectively have the sound waves transmitted into electrical signals for the brain. The technology that is used in treating both types of hearing loss has evolved a lot over the years, and currently, even kids who are born with hearing impairment can get implants and benefit from having a replacement of their missing auditory sense. The most important step in getting treatment is a proper diagnosis of the condition. A competent ear doctor will help correctly diagnose the condition and offer options on how to treat hearing loss. How does your voice box (larynx) work? Your larynx produces sound like this: First, air is pushed out the vocal cords. Then, passing air causes these cords to vibrate, which in turn produces sound and speech, according to the Mayo Clinic. An irritated throat or vocal cords interfere with this process. It’s important to remember that hoarseness itself is not a disease but the symptom of a disease. Effectively treating symptoms won’t resolve the underlying cause. This is why it’s so important to see your local ear, nose and throat physician—such as those at Raleigh Capitol ENT—who will be able to get at the heart of the matter and create an effective treatment plan. Hoarseness is more common in those who use their voice in their everyday careers, such as call-center operators, singers, coaches and teachers. It’s also seen a lot in those over 65 or boys between the ages of 8 and 14, according to the American Academy of Otolaryngology. How long should hoarseness last? Avoiding dehydrating beverages, such as beer, wine and caffeinated drinks. There are so many potential causes of hoarseness. While most are benign, some can carry life-threatening consequences if left undiagnosed. Our ear, nose and throat physicians have the extensive experience that enables us to accurately pinpoint the cause of your problems and offer customized solutions to help you. Prescription drugs, such as meclizine, glycopyrrolate, or lorazepam, can be used to relieve the dizziness experienced with Ménière’s disease. Labyrinthitis: This is an inflammation of the inner ear labyrinth, and the nerve within that is responsible for encoding the body’s head motion and position as well as sound, known as the vestibulocochlear nerve. It is usually caused by a viral infection. Ménière’s disease: A buildup of fluid in the inner ear can lead to attacks of vertigo with ringing in the ears and hearing loss. It tends to affect people between the ages of 40 and 60 years. The National Institute on Deafness and Other Communication Disorders (NIDCD) estimates that the prevalence of people in the United States currently diagnosed with Ménière’s Disease 615,000. It may stem from blood vessel constriction, a viral infection, or an autoimmune reaction, but this is not confirmed. BPPV: This is thought to stem from a disturbance in the otolith particles. These are the crystals of calcium carbonate within inner ear fluid that touch the sensory hair cells inside the semicircular canals during movement. They stimulate the vestibular nerve to send information to the brain about a person’s position. BPPV normally affects older adults, and the cause is usually unknown. It has been linked todementia and twice as common in women as in men. These parts of the brain deal with the interaction between a person’s perception of vision and balance. The doctor will ask about ask about the patient’s medical history, including any history of migraine headache or a recent head injury or ear infection. The patient is asked to fix their gaze on the tip of the doctor’s nose while the head is moved quickly to one side. The test gives a positive result if the patient cannot keep the eyes on the examiner’s nose during the quick head movement and quickly moves their eyes back to look at the nose. By determining if this effect is seen when the head is moved to the left or the right, this may assist the doctor in finding out which side’s inner ear is affected, should the patient have vestibular dysfunction. However, a positive test could be due to a central nervous system problem. Myth Exposed: The most common cause of hearingloss is advancing age. What price would you put on quality of life? Research studies indicate 9 out of 10 people with hearing devices believe their quality of life has improved. Overall satisfaction in people who have worn hearing devices for one year is 78%, close to satisfaction ratings for most consumer electronics. Effective communication is just one of the benefits of hearing devices; users report improvements in their relationships, emotional and physical well being, self-confidence, sense of humor, mental and cognitive skills, and sense of safety. Thyroid problems affect an estimated twenty million Americans and about 60% of those that do suffer from thyroid problems, goes un-diagnosed. The thyroid plays a major role in your body’s functions. The thyroid is a butterfly shaped gland located in the throat that helps our metabolism along with some minor and major bodily functions. Many people don’t even realize they have a thyroid problem. However, there are some common signs that can help alert people to thyroid problems. ENT Specialists would like to share some common signs of thyroid problems to help people become more aware of this ever growing medical condition and when to seek help. Depression – An over or under active thyroid can affect human moods. Hypothyroidism is a thyroid condition that can make a person feel tired, sluggish and depressed. Hypothyroidism is also known to cause restlessness and anxiety. Constipation – Hypothyroidism cause hormonal production disruption that slows down the digestive system resulting in frequent constipation. For those who suffer from regular constipation, this is a common sign of hypothyroidism. Over Sleeping – When your thyroid isn’t functioning correctly it can make a person feel sluggish and one’s activities can slow way down. Additionally, a person could feel very tired and sleepy any time during the day. Hair Loss and Dry Skin – When a person begins to lose a lot of their hair, this could be due to the thyroid. The thyroid, when suffering from certain conditions, can interrupt hair growth due to an over production of certain hormones. This also has an effect on the skin as well. When the metabolism slows down it can cause skin to dry and even feel itchy. This is due to your body not producing enough sweat. Weight Gain – For those who have sudden weight gain without changing their diet or slowing down their regular activities, this is also a sign of a thyroid problem. It’s expected that one will gain weight if a person eats more or is less active. However, when a person doesn’t change their habits then it may be due to a thyroid condition. Muscle Pain – When the muscles in the arms, legs, hands, or feet begin to feel tight or numb, it may be caused by the thyroid. If a hormone is depleted or low it can damage the nerves. The majority of the nerves throughout the body sends signals to the brain. When the nerves become damaged, this can result in muscle pain and numbness. High Blood Pressure – For those who have high blood pressure, usually diet and excise can correct this problem. However, for those who do diet and continue to suffer from high blood pressure or even bad cholesterol levels, the culprit could be the thyroid. If the thyroid is causing high blood pressure it can result in severe medical conditions such as an enlarged heart or heart failure. Altered Taste or Increased Appetite – When food tastes different or your appetite increases, this is often caused by hypothyroidism or in other words an overactive thyroid. Swelling or Discomfort in the Neck – If you notice a lump in your throat or swelling along with discomfort, this is a common sign of a thyroid disorder. Sometimes this can also affect the sound of a person’s voice. Hot and Cold – A thyroid disorder can often disrupt the body’s ability to regulate body temperature. Those with hypothyroidism often feel colder than others while those with hyperthyroidism will feel hotter than others and even sweat more.